Rankings for the top 100 books in an Amazon category Change hourly. 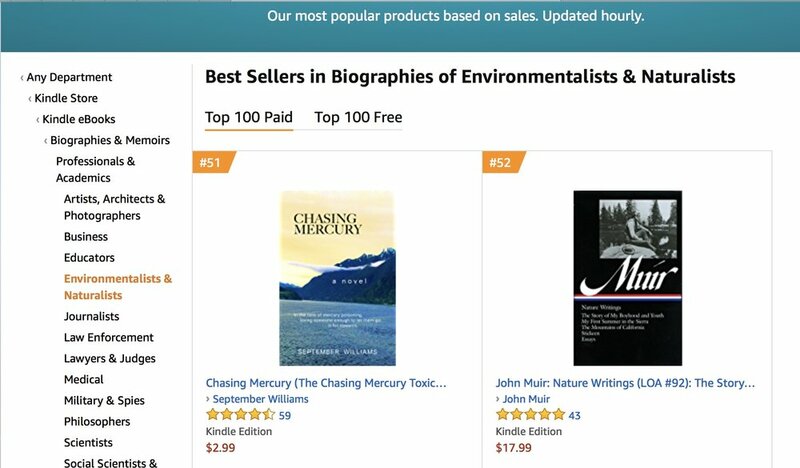 I hope Chasing Mercury lives as long and happy life as works by Muir, Thoreau, Jane Goodall and other environmentalists and naturalist stories based in truth. Something interesting -- Chasing Mercury -- A novel is as a reward for it's ranking-- is being promoted with the print book so you may by the print book for less the cost of the ebook and have both. You never know when Amazon is going to do that. At first I was annoyed -- the Union Maid in me -- but it is a principle of marketing -- overing something for nothing but not really. Additionally -- Chasing Mercury ebook is set up for Whisper Sync so you can also get the audiobook to read to you in my voice on when you are busy and can't hold the ebook or the print book -- like when you are driving. I didn't think it was that important until I read a review of Chasing Mercury on Amazon: https://www.amazon.com/gp/customer-reviews/R3GZKBUR6YI0J5/ref=cm_cr_othr_d_rvw_ttl?ie=UTF8&ASIN=B078S4K8S9 -- Whisper Sync could have really help this reviewer out!! !